In addition, Red Brangus exhibit early puberty, with heifers ready to breed at about 14 months and calve on or before their second birthdays, and bulls are ready for light service as early as 14 months. Both bulls and females retain their productivity well past many other breeds, with females still producing at 14 to 15 years of age and bulls in service at age 10 and older. 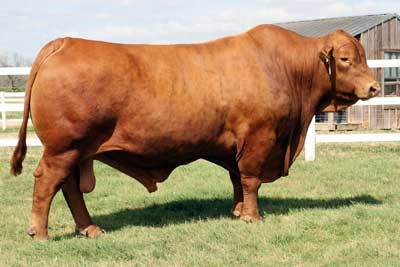 Red Brangus are a moderate size with mature females weighing in the range of 1,100 pounds and mature bulls weighing in the 2,000 pound range. Their red color is not only pleasing to many cattlemen, but eliminates pink eye and sunburned udders and allows the cattle to forage under extreme heat conditions while others are seeking shade or tanks. Their disposition makes them ideal for the wide open spaces of the western ranges and safe for the week-end rancher. The natural polling of Red Brangus eliminates the danger of horns and the management chore of dehorning. From South Africa to South America and Australia to America, Red and Black Brangus brings an unequaled combination of Brahman hardiness and Red and Black Angus quality with tremendous adaptability. The combination is a breed that is superior to the original foundation parents. Maternal Traits Longevity, milking ability, calving ease, efficiency and mothering ability are key components of any operation and again Red Brangus females and Brangus-influenced replacement females are recognized for their excellence in these areas. Adaptability Red and Black Brangus can withstand the heat, humidity and parasites that are prevalent across the tropical and sub-tropical parts of the world. Red Brangus and Brangus-influenced cattle are out grazing and doing their job regardless of the severity of the heat. Yet these same cattle withstand the cold very well. Red Brangus and Brangus-sired calves have excelled in feed yards found northern climates for many years. Purebred herds of Brangus can be found throughout the Midwest and mountainous regions of the Western U.S. They are adaptable to wide range of climates and conditions. Heterosis Research proves that by crossbreeding Brangus cattle a producer can capitalize on 50% more pounds of calf weaned per cow over her lifetime – that is an impressive 30% over what crossbreeding British and Continental cattle can deliver. From an economic perspective, the most important gains from heterosis are made in heritable traits that are often difficult to measure. Traits like calf livability, survival to weaning, conception rate, age at puberty and many others all benefit from heterosis. The individual change in one trait is small, but the cumulative effect on total lifetime productivity is tremendous and research says as much as 20 percent higher. With Brangus, heterosis is part of the package and predominant profit factor. For commercial producers, crossbreeding with Red Brangus and Brangus will provide much more pounds of weaned calves. Carcass Traits Carcass merit is definitely a strength the breed can bring to any operation. In today’s economy, cattle must excel on the rail and be desired by the consumer. Brangus cattle routinely grade Choice and produce a pleasant eating experience. In addition, Red Brangus and Brangus-influenced cattle are readily accepted in most branded beef quality programs. Feedlot Efficiency Red Brangus and Brangus sired calves are efficient feeders and because they have that touch of ear, they are hardy and strong. Their rates of gain and feed conversion are very desirable with documentation from university studies and individual feedlot reports to validate the merits of Brangus calves.